Lunar Magic ist ein mächtiger Level-Editor für Super Mario World. Diese Version behebt einen Fehler, wenn Mario in einem horizontalen Wasser-Level über Screen 0 schwimmt. Außerdem wurde eine Option zum "View"-Menü hinzugefügt, mit dem sich der Inhalt von Fragezeichen-Blöcken ansehen lässt. Näheres in der "What’s New?" Sektion der Hilfedatei. This version of Lunar Magic fixes a potential issue with Mario swimming above screen 0 in a horizontal water level, adds a view option to see block contents, and does a few other things. You can check the "What's New" section of the help file for more details. Diese Version behebt einen Fehler mit sekundären Eingängen in ROMs, die mithilfe der Verson v2.43 oder früher von Lunar Magic aktualisiert wurden. Auch wurden wieder einige kleine Fehler behoben – näheres in der Hilfedatei von Lunar Magic unter "What’s New". This version of Lunar Magic fixes an issue with secondary entrances in ROMs upgraded from version 2.43 or earlier of LM, and a few other small things. Read the "What's New" section of the help file for more details. Ein paar Fehler wurden behoben, u.a. einer, bei dem dem "No Yoshi"-Intro Tiles gefehlt haben und ein Problem mit dem Scrollen per Mausrad. * fixed a bug from 3.00 where vertical levels with a "No Yoshi" intro would have tiles missing in the intro. Thanks goes out to Shiny Ninetales for reporting this. * fixed a bug from 3.00 where if there was only a horizontal scroll bar you couldn't use the scroll wheel to move objects backwards/forwards by one. Thanks goes out to Daizo Dee Von for reporting this. * fixed a bug from 2.41 where the warning for sprite 19 (display level message 1) could be triggered in level 0xC5 when using the "Import Multiple Levels from File" function. Thanks goes out to WhiteYoshiEgg for reporting this. * fixed a bug in the original game where if you placed Mario's starting position near the far right side of a horizontal level, the game would not set the initial X scroll position correctly. Lunar Magic ist mittlerweile 18 Jahre alt! In dieser Version wurde ein ASM-Hack integriert, der das Verstellen der Höhe von horizontalen Leveln erlaubt. Es gibt auch ein neues FG/BG Init-System mit neuen Optionen für Eingänge, Verbesserungen für den Sprite Loader (so können sich nun 128 Sprites in einem Level befinden, statt 84), Unterstützung für geheime Ausgänge 2 und 3 im Overworld-Editor und viele weitere Änderungen und Fixes. Alle Änderungen findet ihr hier unten im recht umfangreichen Changelog oder in der Hilfe-Datei von Lunar Magic. * integrated an ASM hack submitted by Vitor into LM that allows changing the height of horizontal levels, effectively making it possible to change the level dimensions. You can find the new setting controlling this in the "Change Properties in Header" dialog, along with a new * option that lets you view the full bottom row of tiles in horizontal levels. * the sprite loader now has a cache added by Vitor to reduce the performance impact from parsing most of the sprite list to access sprites on later screens. * added a setting to the "Change Properties in Sprite Header" dialog to control the sprite vertical spawning range for horizontal levels and an option for smart spawning. * levels can now have up to 128 sprites instead of 84 for non-SA1 ROMs. * a limitation of the original game where sprites could not start with an FF byte has been removed (previously LM would silently move the sprite on save when it encountered this to avoid premature termination of the sprite list for the level). * in vertical levels most objects will no longer break up on horizontal subscreen boundaries (but they still will on vertical ones). * added an option for entrances to use a new FG/BG init system which can set the FG relative to the player, and calculates the BG position relative to the FG position, scroll settings, level height, and BG height. The BG height is a new setting in the "Change Other Properties" dialog, along with an option to just set the BG relative only to the FG which is meant mainly for layer 2 levels. * added 4 new vertical scroll settings for layer 2 (Variable 2, Variable 3, Variable 4, and Slow 2). Note that these take up slots that were previously blank (H/V Scroll of None), so you may want to double check your scroll settings in older levels. To have H/V scroll set to None, you should be using the 4th entry in the list rather than one of the later ones. * added a new option for entrances to have Mario face the left direction. * made it so that using the "Shoot From Slanted Pipe Right" entrance action combined with the "Face left" option will make Mario shoot left instead of right. * added a new option for midway entrances to redirect a midway entrance to another level. This allows you to have the midway entrance for an overworld level be in another level entirely. * added a new option for secondary entrances to make the level a water level. Note that the older option for the same thing in screen exits can also still be used. * added a new option for secondary entrances to exit to the overworld. You can also optionally set an exit to the overworld to pass the level with the normal/secret exit of your choice or just switch players, use a different base event when passing the level, and teleport to a different location. * added a new toolbar button to the overworld editor that can set secondary exit teleport locations, which uses the same table as the Star/Pipe tiles. * made it possible for the overworld Star/Pipe index table to hold twice as many entries (0x100), to accommodate secondary exit teleport locations. * made it possible to use Secret Exit 2 and Secret Exit 3 in the game. This means the overworld editor now has direction to enable settings on level tiles for both of these, and the Secret Exit 2 and Secret Exit 3 goal point tape sprites have been added to the sprite list. * made it possible to change level tile settings for tiles 0x82-0x86 in the overworld editor. While they can't be entered as levels, they are valid stopping points so this allows you to assign them a level number in case you want them to display a name or give them initial enabled directions. * moved the music and time limit settings from the "Change Properties in Header" dialog to the "Bypass Music and Time Limit Setting" dialog, then renamed the latter to "Change Music and Time Limit Settings". * made it so that when you copy a color to the windows clipboard in the palette editors, it will also copy the SNES RGB hex value in text to the clipboard so you can paste it into edit fields in the ExAnimated Frames dialogs. * added a new toolbar button to the level editor and overworld editor that will insert all GFX and ExGFX then reload the graphics. * added a new view menu option that allows viewing tile surfaces. This is mainly meant for showing the shape of slopes and for revealing if a tile is solid or not. * added a few basic command line functions for some common operations. See the technical section in the help file for more info. * added a new option to the overworld editor that allows disabling the Forest of Illusion ghost from being hidden until an event has been passed. Also made it so you can change the events that it gets shown on. * when linking star/pipe tiles, the program no longer requires that the second tile be a star/pipe tile. This makes it easier to create warps from a star/pipe tile to tiles that you can't warp from. * changed the Modify Screen Exits dialog to allow typing full values directly into the index combo box for faster selection. * changed how the "Insert Manual" dialog works for objects and sprites in the level editor. Instead of specifying X/Y and the screen number, LM will now simply insert the object or sprite near the upper left corner of the level editor window. * made it so that the sprite size table is loaded on level load, not just on ROM load. * added "Delete All" to the level editor's "Edit" menu, which was previously only available through the Ctrl+Del keyboard shortcut. * moved Shift+Scroll Wheel for Bring to Front/Send to Back to Ctrl+Alt+Scroll Wheel, added Ctrl+Shift+Scroll Wheel for vertical scroll, and made Shift+Scroll Wheel and Ctrl+Shift+Scroll Wheel unaffected by objects/sprites selected. * tweaked some code so that scroll bar thumbs are now sized proportionally more like the way you'd expect. Thanks goes out to Vitor for pointing this out. * fixed a bug from 2.43 where the undo/redo/F3 keys in the palette editors would not function while any other modal dialog window in the program was open at the same time. * fixed a crash bug from 2.30 that could occur under certain circumstances when selecting tiles in the Layer 1 Event Editor Mode of the overworld editor. Thanks goes out to Wiimeiser for reporting this. * fixed a bug from 2.30 where if you saved a level then used undo to revert a change to a secondary entrance then saved again without making any other changes to secondary entrances, LM would not save the reverted change for the secondary exit. Thanks goes out to Ramon for reporting this. * fixed a bug from 1.70 in smkdan's VRAM patch where if you rapidly scrolled past the top of the BG image (such as by setting layer 2's vertical scrolling to constant), there was a chance you could get a brief 1 frame glimpse of a couple rows of pixels at the top or bottom of the screen showing the wrong tiles. Thanks goes out to Vitor and Super Maks 64 for reporting this. * fixed a bug from 1.10 where the program would not load/save/export/import the last color of the Special World shared palettes for when Special World had been passed. Thanks goes out to yoshifanatic for reporting this. * corrected the description for Mario Action 7 of midway entrances to "Do Nothing or Pipe Exit Down (Water Level)" and changed how it's displayed in LM. Normally midway entrances that use this setting skip the pipe exit part. It never came up in the original SMW levels, though it seems to have been used in SMA2. However it still acts as a pipe entrance if accessed via a screen exit. To avoid confusion, it may be better to instead use the "Vertical Pipe Exit Down" action with the separate "Make this a Water Level" setting. * renamed Layer 1 vertical scroll setting 2 to "No Vertical Scroll at Bottom unless Flying/etc" to more accurately describe what it's for. Also adjusted the code for this setting to work for horizontal levels that have different heights and vertical levels. * fixed an issue in the original game where when switching between levels if you entered a level with layer 2 horizontal scrolling set to None, the layer 2 X position was carried over from the last level instead of being reset to 0 like it does when entering from the overworld. * fixed an issue in the original game where if a "No Yoshi" entrance intro is activated for a vertical level, the layer 2 Y position in the intro could be wrong and even possibly display garbage tiles. * fixed an issue in the original game where using a pipe exit at the very top of a vertical level could malfunction if Mario's Y coordinate ended up being beyond the top of the level. * added a fix for the original game where the sprite load status for indexes 64-127 were not cleared between sublevels, leading to some sprites not appearing if a sprite at that index was killed in another sublevel. * adjusted tile used for sprite 99 (Volcano Lotus) in LM so it will appear the same way in the editor as it will in the game. Thanks goes out to WhiteYoshiEgg for reporting this. * added a bit of info for sprite 70 (Pokey), as it can't detect if Mario is riding Yoshi if it's within spawning distance of Mario entering the level. Thanks goes out to Wiimeiser for pointing out that something was up with this. FuSoYa hat den Super Mario World Level-Editor "Lunar Magic" aktualisiert. Einige kleinere Fehler wurden behoben und ein paar Funktionen hinzugefügt. So lassen sich jetzt bspw. einfach ROMs und Paletten auf den Editor ziehen, um sie zu öffnen und Level können direkt am Startpunkt geöffnet werden. * fixed a bug from 2.40 with ExAnimation on the overworld where if you tried to use multiple slots for the same destination tile to do faster animations, the frames would not always appear in the order you'd expect. Thanks goes out to Noivern for reporting this. * if overworld ExAnimation is installed, it will also now fix a small issue present in the original game where the bottom waterfall tile animation would not consistently match up with the main waterfall tile. * fixed a glitch in the original game where sprite 52 (moving ledge hole) would appear in the wrong position if placed at the top of a sub-screen. Thanks goes out to Thomas for discovering this, and zacmario for reporting it. * fixed a minor issue from 1.70 where the timing of the victory pose at the end of the level didn't really match up to the music in non-SA1 ROMs. * corrected info on sprite 45 (directional coin) as it does in fact have a time/coin limit. Thanks goes out to Katerpie for reporting this. * replaced some non-standard apostrophe chars in some tooltips in the General Options dialog that could get displayed oddly on non-english systems. Thanks goes out to Akaginite for reporting this. * fixed a small issue that's been around forever where using a mouse gesture on a screen exit that goes to a vertical level did not scroll the screen for the corresponding entrance of that level into view. * made it possible to use Ctrl+Alt+F7 in level editor for advanced users to edit more local ExAnimation slots by sacrificing global slots (when global animations have been disabled for level/submap). * made it possible to use Ctrl+Alt+Shift+F8 in overworld editor for advanced users to enable editing more levels and events (the game does not currently support this at the moment, so don't enable it unless you're adding your own ASM for it). * added the ability to drag and drop a ROM, mwl, map16, or palette file into the main level editor window to open the file. * made it possible to use Alt-Middle click to edit screen exits. * added LM_MOUSE_EDIT_SCREEN_EXIT to function names for user toolbars. * added an option to open levels at the main level entrance. * added an option to pause animations when the program loses focus. 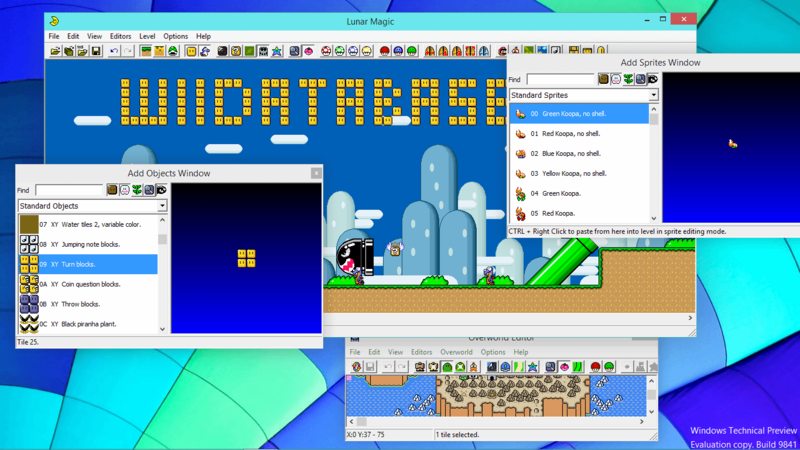 * added an option to display the ROM file name and path in the main window title bar. FuSoYa hat den Super Mario World Level-Editor aktualisiert. This release of Lunar Magic has double the space for FG and BG Map16 (meant for large scale collaborations), 16x the number of secondary exits, the ability to resize objects from top/left and related corners for most objects that support it, and a few other additions and fixes. See the "What’s New" section of the help file for more info. Do note that if you use a third party block tool type program, you shouldn’t use the new FG tiles (0x4000-0x7FFF) in LM until your program has been updated to deal with the new max. FuSoYa hat an Weihnachten seinen Super Mario World Level-Editor aktualisiert. Wenn der Paletten-Editor fokussiert ist, kann nun F3 gedrückt werden, um die Farbe des Pixels unter der Maus in die Zwischenablage zu kopieren. Rückgängig-/Wiederholen-Shortcuts wurden ebenfalls zum Paletten-Editor hinzugefügt und das Aussehen des Sprites 0x7A (Feuerwerk) wurde korrigiert. Ferner wurden eine Bugs gefixt, insbesondere in Bezug auf DPI-Virtualization ab Windows Vista. Übrigens erschien die erste Version von Lunar Magic im September 2000! - added a new keyboard shortcut of F3 to the palette editors to allow copying the color of any pixel on the computer screen to the windows clipboard. Note however that the palette editor must have the window focus, and it may not work on all windows or protected media. - enabled undo/redo keyboard shortcuts in palette editors. - updated filter in Add Objects window for extended object 7F (skull and crossbones) for ghost houses. Thanks goes out to imamelia for reporting this. - adjusted the appearance of sprite 0x7A (fireworks) in the editor to match the game. Thanks goes out to Footsteps_of_Coins for reporting this. - made it so that if you attempt to go past the min/max level in the level editor, it won't bother with bringing up the save dialog. Thanks goes out to Erik557 for noticing this. - saving level 0 or 100 to a different level number will no longer mark half the available secondary entrances as used if the "transfer secondary entrances" option was on. - tweaked some code to workaround coordinate rounding issues in Microsoft's DPI virtualization code that can occasionally violate ClipCursor functionality. - added "System DPI Aware" option to general options, to avoid DPI virtualization done by Windows Vista and later when possible. MarcuzD hat einen IPS-Patcher mit dem Namen "REDThreeUp" für den 3DS veröffentlicht. Mit dieser Homebrew können IPS-Patches auf ROMs angewendet werden – und das direkt auf dem 3DS! IPS-Patches werden verwendet, um ROM-Hacks legal zu verteilen, anstatt direkt illegal die ROM hochzuladen. Drücke X, wähle die IPS, drücke A und wähle die ROM, die du patchen möchtest, navigiere danach in den Ordner, in den die gepatchte ROM abgelegt werden soll, drücke START und gebe den Namen ein. Fertig! Ein Demo-Video gibt es auf YouTube. Der Super Mario World Level-Editor Lunar Magic von FuSoYa wurde aktualisiert. Ein Absturz aus der v2.40 im Background Layer 2 Editor wurde behoben, zudem wurden Tooltips für die Icons in den "Objekt/Sprite hinzufügen" Fenstern hinzugefügt. Mehr im Changelog. Die erste Version von Lunar Magic erschien übrigens am 24. September 2000, das macht Lunar Magic zum ältesten Programm in unserer Datenbank! - fixed a crash bug from 2.40 that could occur under certain circumstances with the Background Layer 2 Editor. Thanks goes out to Luks for reporting this. - added tooltips for the preview icons in the Add Objects/Sprites windows. - added 2 forest tileset specific ledge edge subobjects to the "Add Objects" list that had been overlooked. Thanks goes out to yoshifanatic for reporting this. - increased the tile tracking limit per object to account for largest possible DM16 size. Thanks goes out to yoshifanatic for reporting this. - enabled rest of SuperFX RAM remap from 2.41. FuSoYa hat seinen beliebten Super Mario World Level-Editor Lunar Magic auf v2.41 aktualisiert. Diese Version hat einige kleine Tweaks und Verbesserungen. Konsultiert bitte die Hilfe-Datei für einen umfangreichen Changelog. Wusstet ihr, dass Lunar Magic zuerst am am 24. September 2000 erschien? This is a minor release of Lunar Magic that has a few tweaks and additions. There is one notable fix however, as sprites were not triggering custom block ASM when touched from the side in layer 2 levels on layer 2 (and it seems it's been that way forever). Check the "What's New" section of the help file for details. FuSoYa hat seinen beliebten Level-Editor für Super Mario World "Lunar Magic" aktualisiert. Gleichzeitig feiert das Tool seinen 15. Geburtstag und seinen 40. Release. Definitiv das älteste Tool auf der WiiDatabase! Die Änderungen könnt ihr im Changelog nachlesen. This release of Lunar Magic adds support for ExAnimation on the overworld, more overworld exit path indexes, .palmask files to specify which colors in the palette should be imported into your level, more zoom levels, 8x8 tile fill in the overworld editor, improved Z-order related commands in the level editor, and other small changes and features. Check the "What's New" section of the help file for the full list. Note that this version also adds an option that scans the user area of the ROM for nested RATs on Full Restore Point creation. This can sometimes help detect corruption caused by third party tools and patches soon after it happens, rather than having it go unnoticed for long periods of time. If you'd rather not get this notification, you can turn it off in the restore options. Lunar Magic, der Super Mario World Level-Editor wurde aktualisiert. Es wird eine Super Mario World v1.0 ROM benötigt. Diese herunterzuladen ist aber illegal. Ein Bug der letzten Version wurde behoben, bei der die Animation des Schalterpalastes die Weltkarte temporär korrumpiert hat. 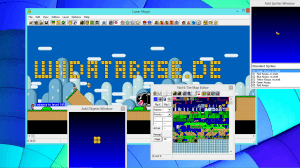 Ein paar weitere Fehler aus der letzten Version wurden auch noch behoben, beispielsweise Probleme mit dem Layer 3, dem Zoom und dem "Add Objects/Sprites" Fenster. Weiteres lesen Super Mario World Profis im Changelog nach. - fixed a bug from 2.30 where the flying switch blocks on the overworld that appear when you pass a switch palace would temporarily corrupt part of the overworld's animated tile GFX in the game as the RAM they use overlapped with the extra space that the new 4bpp tiles take up. The fix will be installed when the GFX/ExGFX are inserted. Thanks goes out to 33953YoShI for reporting this. - fixed a bug from 2.30 with the M16-7k dialog, where it wouldn't draw/behave correctly. - fixed a minor issue from 2.30 where the layer 3 CGADSUB checkbox would not always be disabled when it should be. Thanks goes out to Hinalyte for reporting this. - fixed a minor issue from 2.30 where if x2 zoom was already enabled in the Add Object/Sprite windows when the program was started, the list height was shorter than it should be. Thanks goes out to Underway for reporting this. - fixed a minor issue from 2.30 where closing the Add Objects/Sprites windows would not let you use the level history mouse gestures without having to hold down the Shift key. Thanks goes out to Wiimeiser for reporting this. - added the ability to set custom sprite appearances and tooltips in the editor based on the last 1, 2, 3, or 4 bits of the sprite's X and/or Y position. Check the help file for more info. - expanded the Map16 space for custom sprites in the editor from 8 to 0x10 pages. - tweaked the "Insert all Slots" button of the "Edit ExAnimated Frames" dialogs so that it will insert starting at the currently selected slot instead of always from the start. Lunar Magic, der Super Mario World Editor, wurde aktualisiert. Damit feiert Lunar Magic sein bereits 14-jähriges Bestehen! Level 3 Tilemaps können jetzt angsehen und editiert werden, außerdem wurden die wohl meistbenutzten Dialoge "Add Sprites" und "Add Objects" grundlegend überarbeitet, sie besitzen jetzt sogar eine Suchfunktion! Auch der Background-Editor wurde überarbeitet, an vielen Stellen wurden "Rückgängig" und "Wiederholen" Buttons eingeführt. Mehr im Ankündigungspost weiter unten und im Changelog in der Lunar Magic Hilfedatei unter "What’s new?". HINWEIS: Wer vorher schon ASM-Hacks zum Umgehen der Layer 3 Grafiken benutzt hat, sollte diese vor dem Editieren entfernen! This release of Lunar Magic adds support for displaying and editing layer 3 tilemaps, bypassing layer 3 graphics and tilemaps, replacement "Add Object" and "Add Sprite" windows, a new background editor with x2 zoom and undo/redo, undo and redo buttons for the level and overworld editor, an option for the overworld that allows merging GFX slots FG1 and FG2 into SP3 and SP4 to create room for 2 more FG slots, graphics reloading on the overworld for exit tiles and player swapping, and several other minor changes and features. Check the "What's New" section of the help file for a full list. Note that if you have already used third party ASM code for bypassing layer 3 GFX, it should be removed prior to using this version to avoid compatibility issues. Today is also the 14th anniversary of the day Lunar Magic was first released! FuSoYa hat seinen Super Mario World Level-Editor "Lunar Magic" aktualisiert. Es wurden einige Bugs gefixt, darunter auch ein schwerwiegende Fehler, wie z.B. beim VRAM-Patch oder im Overworld-Editor. Näheres im Changelog. - fixed a bug from 1.70 in smkdan's VRAM patch where sprite 49 (growing/shrinking pipe end) could cause a few pixels of some tiles to be corrupted if the sprite was near enough to the entrance to be processed during fade in. Thanks goes out to WhiteYoshiEgg for reporting this. - fixed a potential bug that's been around forever where if your overworld had no silent events at all and was not yet using the new format, LM would create a single entry for the table as required by the game's original ASM, but the contents weren't specified so it could end up holding something invalid/harmful. Note that while LM now sets it to "no event" and recognizes that as valid, the entry created by previous versions still has a chance to trigger the new "silent event corruption" warning added in 2.21. In that case simply resaving the overworld in this version will remove the offending entry. Thanks goes out to Wiimeiser for reporting about this. - fixed an issue from 2.20 where opening a level from the "Open Level Address" menu would result in the main and midway entrance not being displayed although the labels still were. - corrected the "Mario Path" displayed for overworld layer 1 tile 0x36, which is actually a water version of tile 0x1C. Thanks goes out to Wiimeiser and mariofreak4500 for drawing attention to this. - increased the allowed number of sprites for the sprite count warning to 255 if Vitor Vilela's RAM remap for SA-1 ROMs has been used. - added some code to prevent attempts at opening a second overworld window under certain conditions. Thanks goes out to Hinalyte for reporting this. - made a minor tweak to the optimized LZ2 and LZ3 ASM code to not attempt decompression if the GFX file has not been inserted, to aid with ASM debugging. Will only take effect once you switch compression formats with this version. moved most of the options in the options menu to their own "General Options" dialog. removed the "Highlight Mouse Cursor in BG Editor" option, as it doesn't seem likely that many people turn it off anyway. added a new "Check if Vertical Fireball has Buoyancy" option to the general options dialog, at Alcaro's suggestion. - fixed a bug from 2.20 where the new "view sprite data" menu item in the overworld editor would display black squares for the sprite data text if the editor had not yet loaded an overworld that wasn't using a custom palette. Thanks goes out to Wiimeiser for helping to figure this out. - fixed a bug from 1.40 (which became more noticeable in 2.10) where changes to the last 8 entries in LM's "Destroy Level Tile Settings" dialog could cause Ghost House/Castle/etc tiles to no longer give the player a save prompt when the event had already been cleared. This is partly due to a mistake in Nintendo's code, as it treats the list as 0x18 bytes long when it's really only 0x10 bytes. This version of LM relocates the table so it can safely have all 0x18 entries, and repairs the other 8 bytes that may have been changed in previous versions. Thanks goes out to Wiimeiser for helping to figure this out. fixed a minor entrance label display positioning issue from 2.20 when switching between vertical/horizontal level layouts. Thanks goes out to Koopster for pointing this out. - fixed a small bug that's been around forever, where if the save prompt for castle/ghost house/etc tiles was disabled and the player passed a level using one of those tiles, the player would move off the level even if the event had already been passed. added a new ASM hack to fix a timing issue in Nintendo's code, where there was a chance that the game could turn the screen on a frame too early during black screen transitions, resulting in a brief full screen flash of color. - disabled some Nintendo ASM that apparently served no purpose, which was preventing ExGFX from being used in tiles 4A-4F and 5A-5F of SP1. This also now makes these tiles 4bpp. added some filtering and warning messages to detect and remove bad event data in the overworld in case people corrupt it with external tools/patching. - made it so that pressing Page-Up in the overworld editor in event editor mode while on event 0x77 will cause the event to be shown as passed, so you don't have to advance through each step with Home/End for that event. Thanks goes out to Everest for bringing this up. - added a small bypass warning in the old GFX bypass dialogs and the tileset change dialog when Super GFX Bypass is enabled, at Alcaro's suggestion. or "Edit Level Names" dialogs in the overworld editor would cause the GFX list for the main overworld map to be changed.